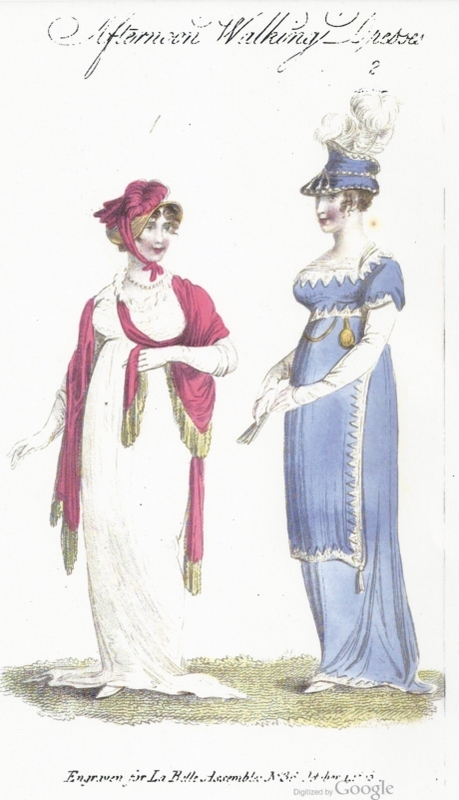 A round gown of fine jaconet*muslin, with short sleeve, and laced or wrought front; wide double frill of scolloped lace, wrought to a point in the centre of the bosom A village hat of brown chip, tied across the crown with a band of apple-blossom sarsnet, ornamented on the crown with the same, or a short full curled feather. A scarf of Chinese silk, the same colour, with a deep palm-coloured fringe, brought partially across the bust, and otherwise fancifully disposed. A silver filligree, or mocho-stone* necklace.—Limerick gloves, and slippers of palm-coloured kid. No. 2.—Dinner, or Dejeune Costume. A round robe, with short train, and demi apron of purple, or violet crape, or muslin; vandyked at each extremity with point lace, or cut white velvet. A full short sleeve, confined fancifully with a simple row of pearl. A folded tucker, and long sleeve of Paris net, with a bracelet of fine pearl. A French watch with pearl chain. Minerva bonnet the same as the dress, band and edging of white beads; full tassel in front to correspond. Minerva plume of white feathers. Shoes of white satin, or French kid. Fan of carved ivory. ...The unfavourable weather which has marked some part of the present month, has called forth somewhat earlier than usual the silk pelisse, which, with those of shawl muslin, lined with sarsnet of agreeably contrasted shades, are very well adapted as a shelter from the chills of autumn. —La Belle Assemblée, Volume 5, 1808. ** Mocho stones are related to the agat, of a clear horny grey, with declinations representing mosses, shrubs, and branches, black, brown, red, in the substance of the stone. —Encyclopaedia Perthensis; or, Universal dictionary of Knowledge, 1816. I can't imagine wearing that clothing - no matter how beautiful it sounds. Tho once in a while might be kinda fun. I can't help wondering, where does one walk in a white dress that trails on the ground?